Bonum Handcraft is a production studio dedicated to creating handmade, one-of-a-kind jewelry & hand embroidered art. We are located in northern San Diego County, California, and our pieces are sold nationally and internationally on line and through select local fine artisan boutiques and markets. 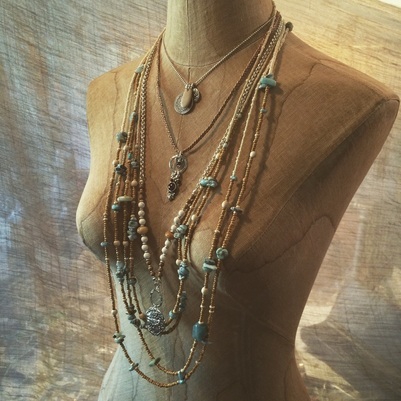 ​Bonum is committed to using the highest quality materials possible; natural gemstones, hand-crafted and selected beads, silver, and gold vermeil feature prominently in many pieces. Whenever possible we try to use eco-friendly and sustainable materials in our work. Nature inspires us and you'll see many of our stones and organic materials are presented in their pure, uncomplicated state. ​Our customers are our life blood and we strive to create unique, meaningful pieces for they will treasure. We have many repeat customers, and it is an honor when they ask us to create one-of-a-kind, bespoke pieces for them or a loved one. We welcome those custom orders, so please, contact us if you're interested in a piece especially made for you. Stephanie Butcher is the artist behind Bonum Handcraft, and her love of nature and family is what drives her work. Growing up in a creative and musical family, Stephanie gravitated to art at an early age. Stephanie lives with her husband, daughter, and house full of animals near San Diego, California.